Over 200,000 imperial pints of Guinness, 5,200 Irish Jam Sessions, 168,000 servings of Fish and Chips, countless parties and celebrations, and over $200,000 donated to our community through local non-profits. Saturday, September 22, The Irish Embassy Pub celebrated their 10th anniversary/Halfway to Paddy’s Day with Celtic music from Patrick Crossing and the Kitchen Jam Band, Irish whiskey shots, and a trip giveaway to Ireland. The evening was supported by Guinness and local distributor A&L Coors with swag and Guinness branded giveaways. To enter the drawing you had to drink a Guinness between St. Patrick’s Day 2018, until Saturday night. The trip was won by Steven Owens. Steven was born in North Carolina and served 24 years as a Civil Engineer with the RED HORSE Expeditionary Airborne Unit in the U.S. Air Force. He now resides in Pagosa Springs and regularly attends the Sunday Irish Jam Sessions at the Pub. Steven will have until May 2019 to take the five night trip for two. 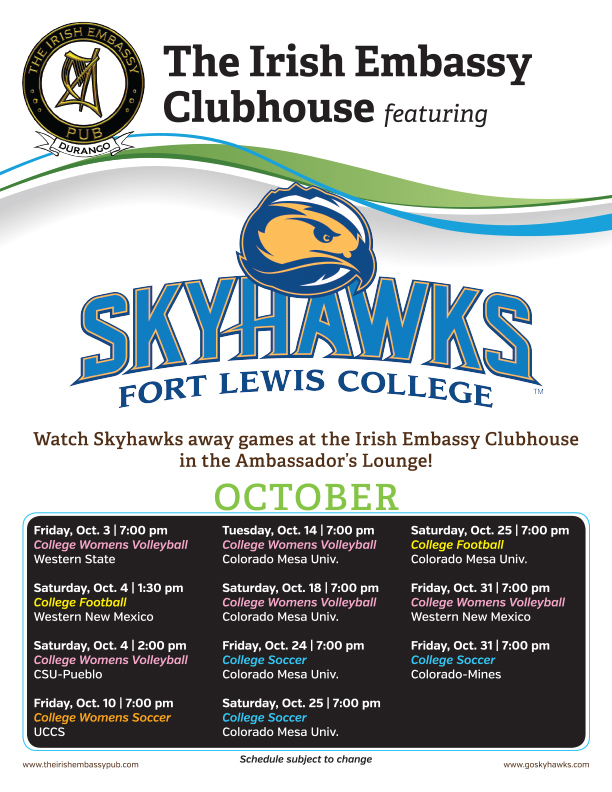 Since its inception, The Embassy has supported countless non-profits in town, most notably The Iron Horse Bicycle Classic, Fort Lewis College Athletics, Durango Devo and DYSA, and the Durango Independent Film Festival. The Irish Embassy Pub officially opened to a packed house July 17, 2008. The pub arose out of an unlikely partnership between a local Durangoan, Mick Ward, and an Irishman, Jim Shannon. The two met while Mick was traveling Europe in the late 70s. They became great friends and spent many years visiting and traveling. When the present building became vacant, Mick contacted Jim about transforming it into an Irish pub. Jim loved the idea, and along with Jerry Hembury and Mike Graham, they transformed the space into an authentic Irish pub. The furniture, pictures on the wall, wood trim, dishes, silverware, glasses, and even some of the staff were shipped in from Ireland to complete the transformation. Over the years some of the owners have bowed out, leaving Mike Graham as the remaining owner. The Embassy includes the Steaming Bean Coffee Shop downstairs, along with a back room that was acquired in 2012 and dubbed the “Underground”. The Embassy is available to rent for private parties, ranging from 6 people to the entire pub (if you so choose). They’re open daily at 11:00am and serve breakfast Saturday and Sunday starting at 7:00am. Win a Trip to the Guinness Brewery! It’s our 10th birthday and to celebrate, we’re giving away a trip to the new Guinness Open Gate Brewery and Barrel House in Baltimore, Maryland during our Halfway to Paddy’s Day birthday celebration in September! Each time you buy a pint of Guinness here at the pub, write down your name, email, and phone number and you’ll be entered to win. It’s that easy! You must be present at the drawing Sept. 22, 2018. Drink specials from Honey House Distillery, and don’t forget to check out the new Steaming Bean downstairs in the lounge!!! The Irish Embassy Pub is preparing to launch a Red Envelope Promotion in the month of December, in which they plan to give away thousands of dollars in food and prizes. “It’s our way of giving back to the community. We’ve been brainstorming ideas as to what we could do to say ‘thank you’ to our loyal patrons, and we came up with the Red Envelope idea,” said Embassy co-owner Gregg Graham. So what is the Red Envelope Promotion? 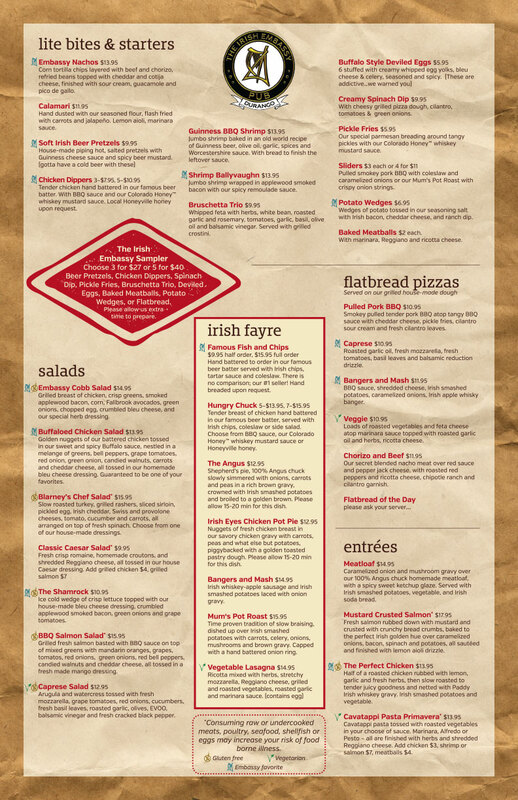 During the month of December, if you dine at the Irish Embassy Pub, your table will be given a sealed red envelope. One thousand envelopes will be handed out in all, and each one will contain a prize. Prizes range from a free appetizer or dessert, to Irish Embassy gift cards, board games, FLC jerseys, and grand prizes include a snowboard and a free draft beer a day for a year. Every envelope’s a winner. Sounds fantastic right? There is, of course, a catch. You cannot open your envelope when you receive it. All the envelopes must be kept until the month of January, when you return to the Pub for a meal, drink, etc. You will then bring your still sealed envelope in, have your server open it, and then claim your prize. Any already opened envelopes will be void, and all envelopes must be claimed within the month of January. 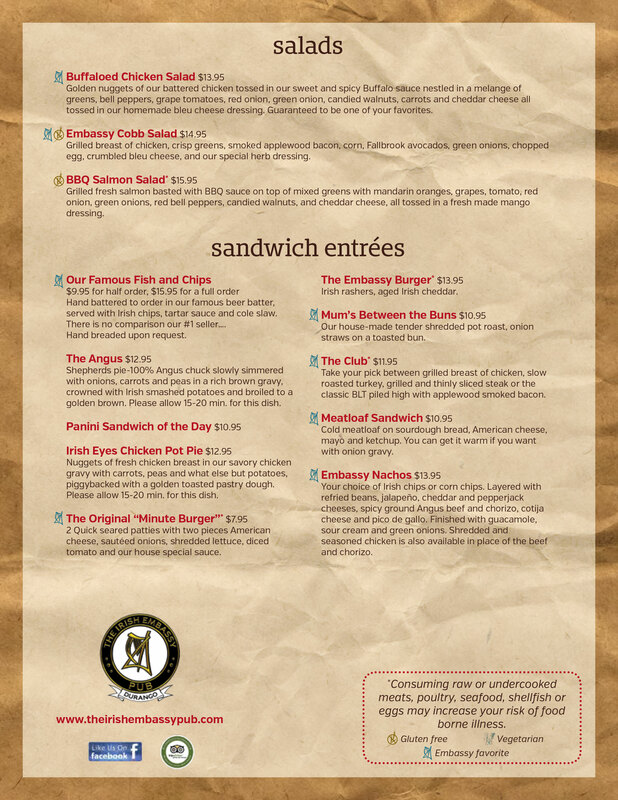 Yes, after much deliberation, we’re finally getting our menus updated! The tried and true favorites are still there (hooray! ), along with some new and exciting options. 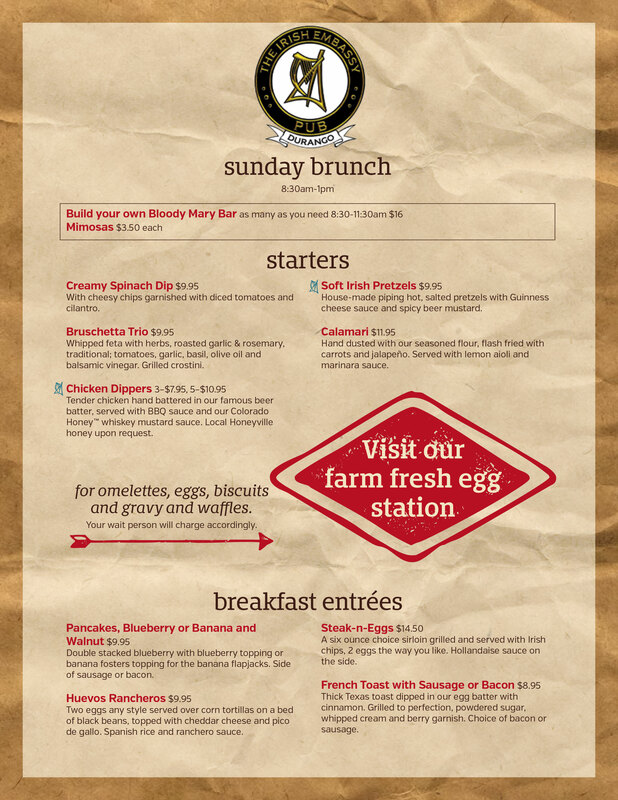 Also new is our Sunday Brunch! 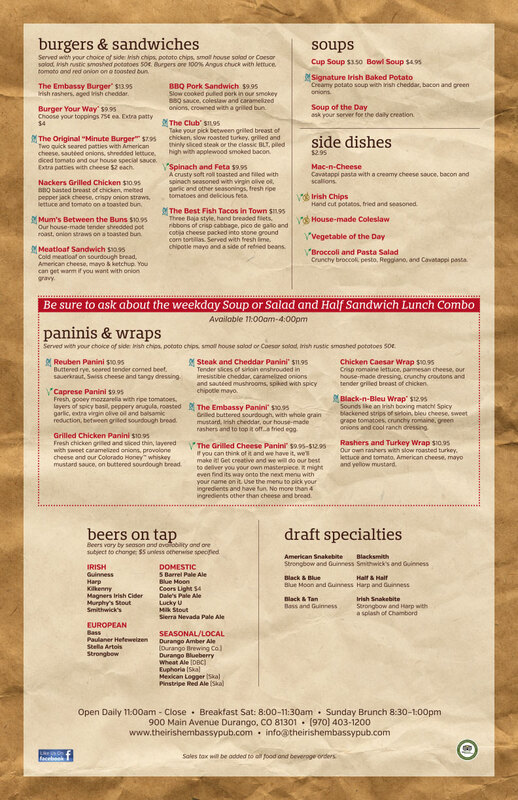 See both menus below, and we’ll see YOU soon!! 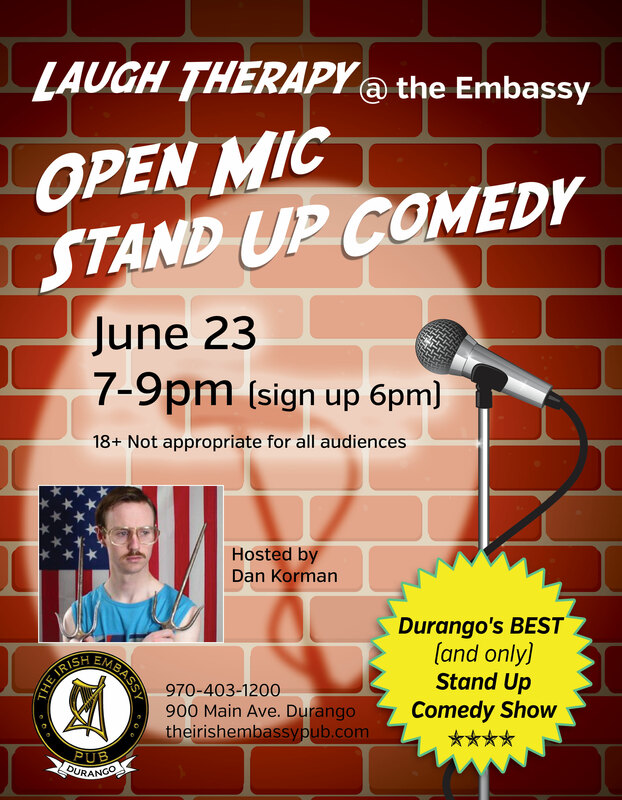 NEW – Laugh Therapy @ The Embassy! Open Mic Stand Up Comedy! June 23, July 9 and July 23, 7-9pm. Open to everyone 18+ (might not be suitable for all ages). Sign up by 6pm. All performers will receive 2 free beers – a little Dutch courage! Hosted by Dan Korman.